Groupon and Phoenix Motorcycle Training have teamed up to offer this amazing deal to improve your riding and get discounts on your insurance. 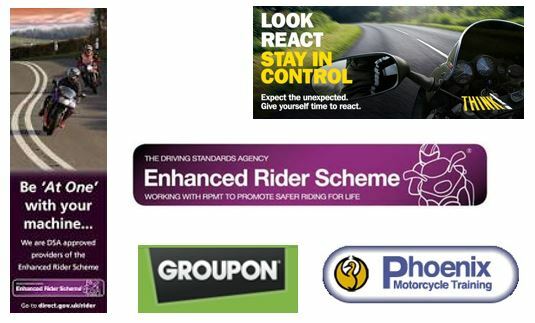 The enhanced rider scheme checks your motorcycle riding skills and provides training to help you improve. It concentrates on identifying weaknesses around key risk areas in on-road riding, such as bend negotiation, overtaking, filtering, positioning and junctions. Phoenix ERS Trainer’s role is to help you to further develop your riding skill and reduce risk. You’ll have a rider assessment with an expert trainer. You’ll ride in different road and traffic conditions. The ride will be long enough for your trainer to make a good assessment of your skills. For most people this is about 30 to 60 minutes. The trainer will then identify a couple of different aspects of your riding that the rest of the session will focus on and give you tips to improve those parts of the ride. If training is needed, a rider development plan is devised that concentrates on the specific areas needing attention, rather than taking a ‘one size fits all’ approach. Firstly you need to purchase a Groupon Voucher from the current deal. Once you have this voucher code you can then click on the link below to select your starting location. Cant find the date you want? then please try one of the other locations and they may have that date available.